Complete slice of NWA 4884. History: Purchased by Greg Hupé in July 2007 from a dealer in Tagounite, Morocco. 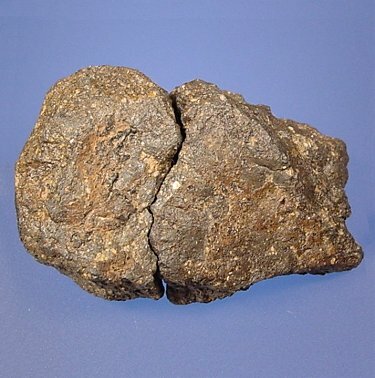 Physical characteristics: A single stone (42 g) partially covered by black fusion crust; interior slices show it to be a breccia composed of white, beige, and light gray clasts in a dark gray matrix (Fig. 3). 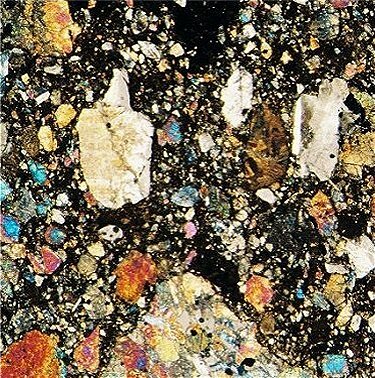 Petrography: (A. Irving and S. Kuehner, UWS) Regolithic breccia composed of abundant angular mineral and lithic clasts in a sparse vesicular, glassy matrix. Mineral fragments include calcic plagioclase, pigeonite, augite, Ti chromite, ilmenite (one with a tiny baddeleyite inclusion) and silica polymorph. Lithic clasts include several types of mare basalt (a coarse-grained example is composed of olivine + zoned pigeonite + calcic plagioclase + ilmenite + troilite), granophyric intergrowths of Fe-rich augite + fayalitic olivine + silica polymorph, a coarse-grained dunitic or troctolitic rock containing a large metal grain (associated with rutile and secondary ilmenite), and a large "breccia-within-breccia" clast. Mare basalt clasts and debris are predominant over highlands lithologies. 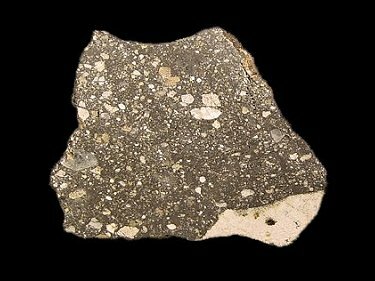 Geochemistry: Olivine clasts (Fa37.0-37.7; FeO/MnO = 94- 98), olivine in basalt clast (Fa87.9; FeO/MnO = 89), plagioclase (An92.4-95.3Or0.5-0.1), pigeonite host (Fs52.3Wo10.5; FeO/MnO = 65.2), augite lamella (Fs31.9Wo31.9; FeO/MnO = 60.3), pigeonite clast (Fs60.1Wo7.0; FeO/MnO = 71.1), augite clast (Fs17.2Wo36.9; FeO/MnO = 53.3). Bulk composition: (R. Korotev, WUSL) FeO = 13.7 wt%; Sm = 3.1 ppm, Th = 0.9 ppm, Ir = 3.4 ppb. Classification: Achondrite (lunar, mingled basalt-rich breccia). Specimens: A total of 8.4 g of sample and one polished mount are on deposit at UWS. GHupé holds the main mass. Submitted by: A. Irving, UWS. Complete mass of NWA 4884. Thin section image in Cross Polarized Light (image measures 7mm wide).